Contemporary homes are always about the quality and convenience. But have you ever thought who provides this convenience? Be it your office or your home, electricity is a major component which has made many things possible. Therefore, if you also want to enjoy this power of electricity in different mediums in your house, then you have to first hire an electrician. He or she is the person who will help you bridge the gap between your smart technology systems and a convenient and peaceful life. We, at JPEG INC, can provide you a well-trained and experienced electrician for both commercial as well as residential purposes. Our electricians can help in everything, right from exhaust fans, data or communication line setups, ceiling fans, lighting, fuses, circuits, water heaters, to control wiring, fiber optic cabling, generators, ballast lamps, and even industrial lighting. So, if you are from areas such as Davie FL, Fort Lauderdale, Hollywood FL, Miramar FL, Plantation FL, or Sunrise FL, you can rely on us. Here, we have put together a few of the most important reasons why an electrician is a must for you regardless of whether it is your commercial space or a residential one. Take a look. Simply purchasing different kinds of new-age appliances or machinery with cutting-edge technology will not be enough; you also need someone to install it or set-up the electrical lines. That is what the electrician does for you. Electrical lines are complex and you might face an issue. 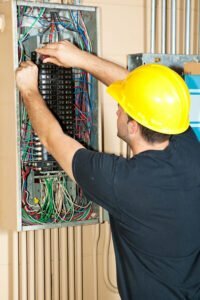 In order to repair and fix these issues, you must hire an electricians. Don’t try to do it yourself because it can be dangerous or even fatal for you. They also guide you regarding further maintenance. So, without any delay, if you think you need an electrician, get in touch with us now.